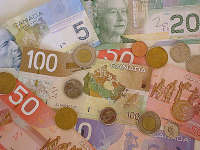 The official Canadian currency is the Canadian Dollar, CAD (symbol C$). And like most other currencies, it's decimal currency. 1 CAD gives you 100 cents. Paper bill are available in the denominations of C$5, C$10, C$20, C$50 and C$100. Among these, currency notes of C$50 and C$100 are not very common in use. The Canadian currency notes are very colourful. Coins come in 1c (penny), 5c (nickel), 10c (dime), 25c (quarter), C$1 (loonie) and C$2 (toonie) denominations. It's very important that you carry some Canadian currency to cover expenses at Pearson airport such as luggage trolley (C$2), porter service (C$10 - C$20) and transportation to your hotel (up to C$50). You can also withdraw Canadian currency upon arrival at an ATM at airport, in case you need some more. You can exchange currency and traveler's check at currency exchanges, hotels, foreign exchange brokers and banks. However, it's best to exchange them at bank to get better exchange rate. Credit cards are considered as one of the most efficient and smart way to carry money. Major credit cards like Visa, MasterCard, American Express are very widely accepted in Toronto. Use of debit card is also widespread. You can use these plastic currencies at hotels, restaurants, bars, shops to pay your bills. However, it's worth noting that some small shops or cafes require you to spend some minimum amount ($10 to $30) per credit card purchase. Also, your credit card purchase is converted from Canadian currency to your native currency at bank exchange rate. You can also withdraw cash advances from your credit cards at banks or ATMs, however, you should avoid this method to get cash because it tends to be very expensive due to interest and transaction fees. You should consult your credit card provider for structure of interest rate and transaction fee on advance cash withdrawal before you leave. You will easily find ATMs in Toronto, in case you decide to get Canadian currency from your own account using ATM card. The ATMs are available within bank premises as well as at the airport, some gas stations, convenient stores and plazas. Keep in mind that you may have to pay service charge for using other bank's ATM. But still it's one of the most convenient and easiest ways to get cash, particularly away from home. Please make sure that you check your daily withdrawal limit and memorize your PIN (Personal Identification Number) before you depart. Traveler's checks are one of the cheapest and safest options to bring money to Toronto. They can be exchanged at banks, hotels, foreign exchange agents. If you bring traveler's checks in Canadian currency, you may avoid the additional exchange rate charges while you negotiate them. It's good idea to note serial numbers of your traveler's checks and keep this information in safe place separate from your traveler's checks. This will allow you get them replaced if they are lost or stolen. The use of traveler's checks has declined since last few years, since ATMs allow withdrawing cash at any time. However, they are still extensively accepted in Toronto. In case you need to visit bank to exchange your native currency or traveler's check to Canadian currency, note that Toronto banks are generally open Mon - Fri 8 am to 6 pm. Some of the branches remain open for extended hours in the evening, specially on Thursday and Friday. Many branches remain open on Saturday morning. Toronto is the most costly city of Canada, but for most of the US and European travelers it will still seem fairly inexpensive and affordable. Here are some typical prices (in Canadian currency) which will give you good estimate about your travel expenses in Toronto. It is custom to tip for various services in Toronto. Generally, in restaurants you are expected to pay approximately 15% of pre-tax bill as tip for standard service. And if service is exceptional and outstanding you may consider giving 20% of bill amount as tip. However, for lousy and rude service (it's really very rare in Toronto) you may tip as low as 10% or might opt to refuse giving tip at all. If this is the case, it's better you speak (politely) to restaurant manager and bring his attention to the real issue. This would certainly help them to improve service for their customer. Some restaurants may include 15% service charge in the bill itself. So before giving the tip, check your bill and make sure that you don't end up paying the tip twice. Tipping is also norm for cab ride. Usually, for short ride tip is $2 and for long trip you may consider giving maximum $5 as tip. Interested to know how much does it cost in your native currency? Then, use the Canadian currency convertor which I have embedded below. This currency convertor uses latest exchange rates to give you as accurate result as possible. Just enter the price in Canadian currency in text box titled 'Desired Amount' , choose your local currency in second select box and hit the 'Perform Currency Conversion' button. There you go! You might be curious to convert your native currency to Canadian currency. To do this, choose your local currency in first select box and Canadian currency in second box and hit the button at bottom.